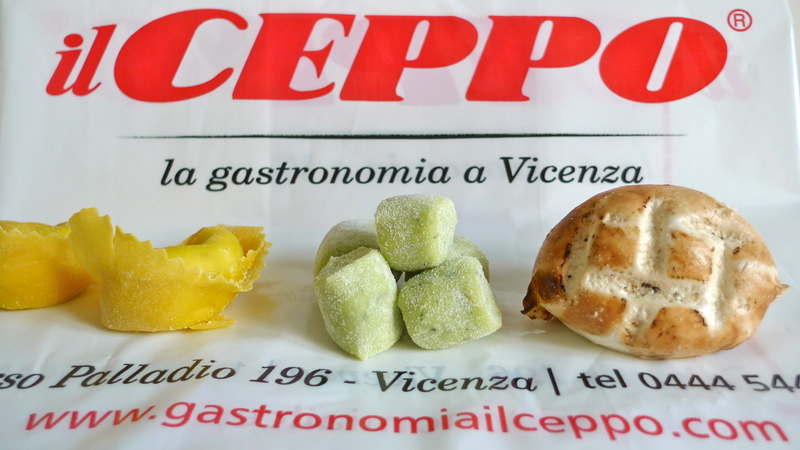 Now that the cat is out of the bag — uncovering that secret foodie destination where my short-order cookin’ alter ego, Lazy Person (LP), has been buying out-of-this-world delicacies for “lab testing” in our kitchen — we can openly plate our first dish from ingredients purchased at il Ceppo (the tree stump), the popular gastronomia shop along the Corso Palladio here in Vicenza. 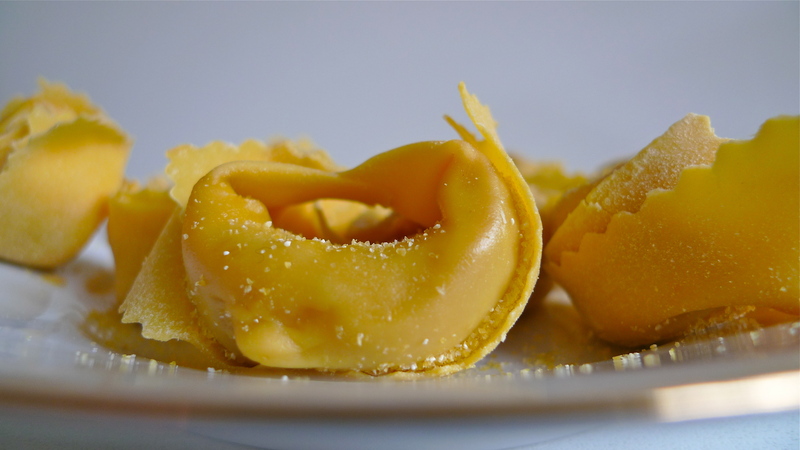 Our lead-off dish is a good one, too: tortelloni (larger versions of tortellini), a navel-shaped egg-and-flour pasta, stuffed with a filling of zucca (pumpkin) and crushed Amaretti di Saronno cookies. It’s a primo piatto (first course) with a hint of dolce (dessert). Did you say NAVEL? Yes, navel-like in shape. 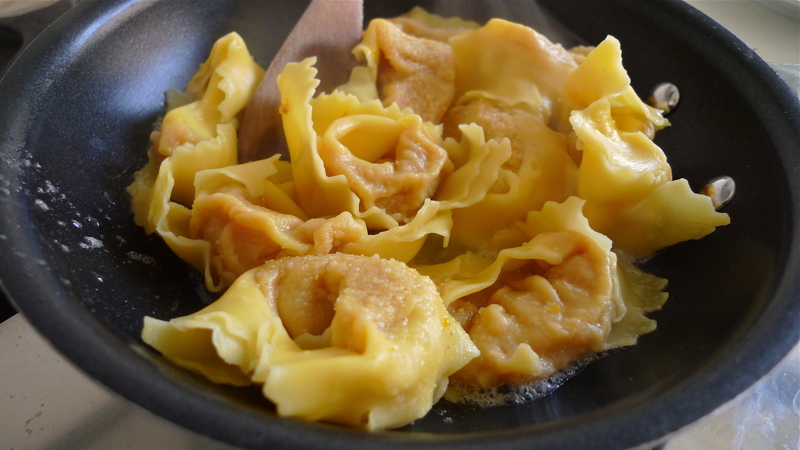 One of many legends, and the one I like best, has it that the tortellini was supposedly created by an inn keeper-cook in Castelfranco Emilia, in the province of Modena over in Italy’s Lombardia region, back in the late 15th-early 16th century when Lucrezia Borgia — the daughter of Pope Alexander VI — spent a night there. 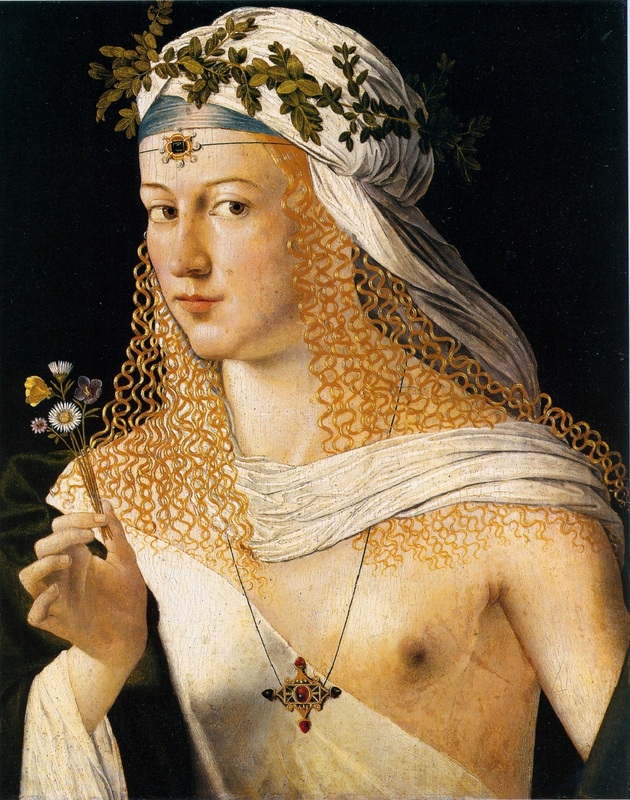 The inn keeper, captivated by Lucrezia’s beauty, just had to get a better look at her. Peeking through the keyhole of her room, the “peeping Tom” hotelier caught a glimpse of her navel in the candlelight. What a navel it must’ve been, because it sent him into ecstasy and he immediately raced downstairs to the kitchen and began creating a pasta that resembled the femme fatal’s umbilicus. Don’t you just love Italian folklore? Now, If you’ll grab an apron, let’s join LP in the “lab” and get this “House of Borgia” lookalike underway. We’ll have it plated in less than 10 min. 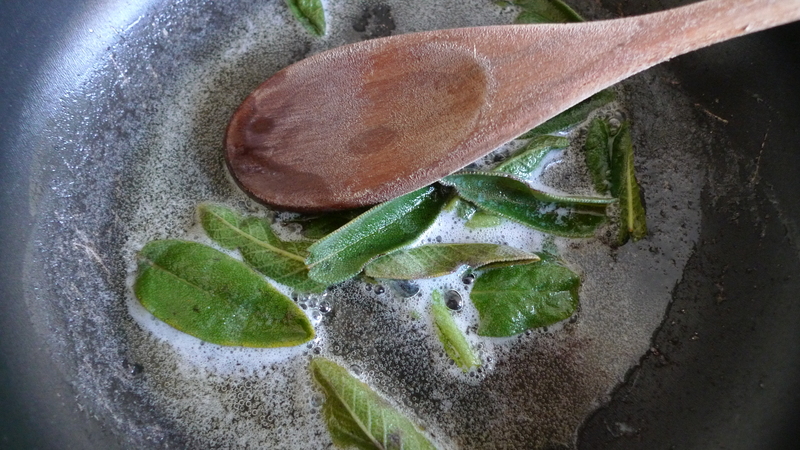 Step-3: In a small skillet, fire the heat to MEDIUM, add the butter, sage leaves and pinch of salt. Cook for 1-2 min. allowing the butter to liquify and absorb the aroma of the slightly crisp sage. Remove from heat, let it rest and wait for Step-6. Step-4: Pasta water is now boiling. 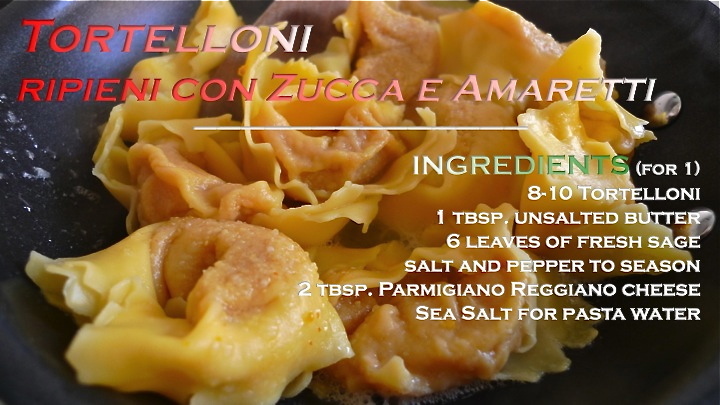 Uncover, add the sea salt and, one-by-one, drop in the tortelloni. Give it a good stir and continue the boil for 5 min. Step-5: Remove pot from heat and drain the pasta. Step-6: Add the tortelloni to the butter — sans the sage leaves — fire the heat to MEDIUM, add in 3/4 of the grated cheese and sauté for 30-45 sec. 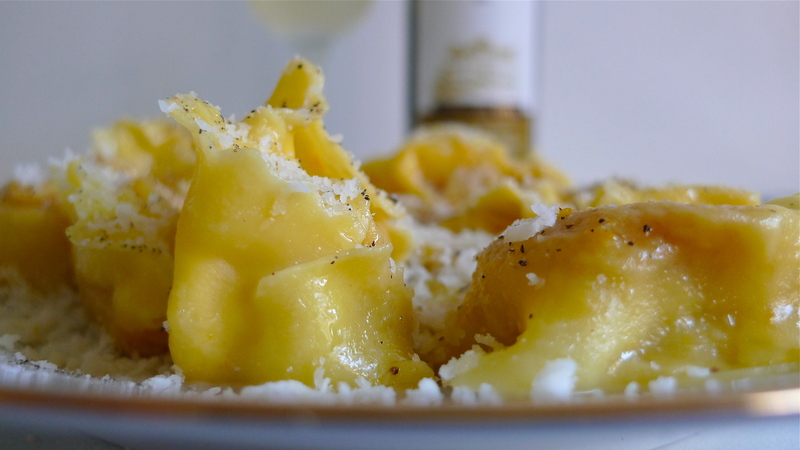 Step-7: Plate the tortelloni, sprinkle the remaining grated cheese on top, add some freshly ground pepper and serve. 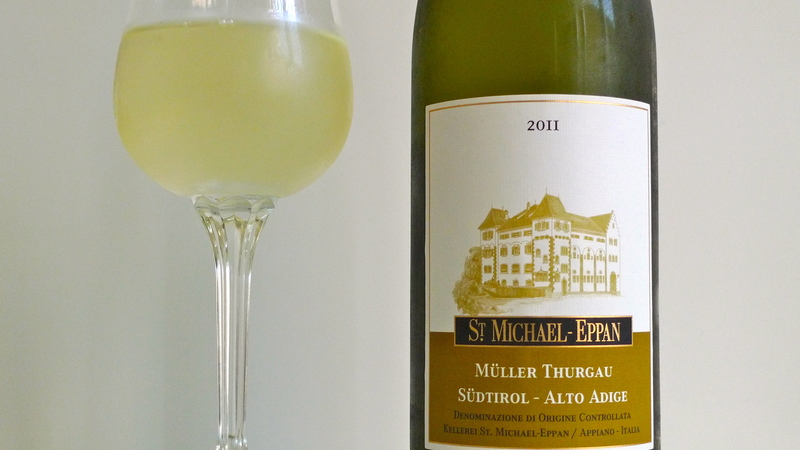 Recommended Wine Pairing: Alto Adige Müller Thurgau 2012 DOC – Kellerei St. Michael, Appiano/Eppan (BZ), Italy — This wine pairing recommendation comes from Maria-Giovanna, one of the two certified sommelier on staff at Gastronomia il Ceppo. 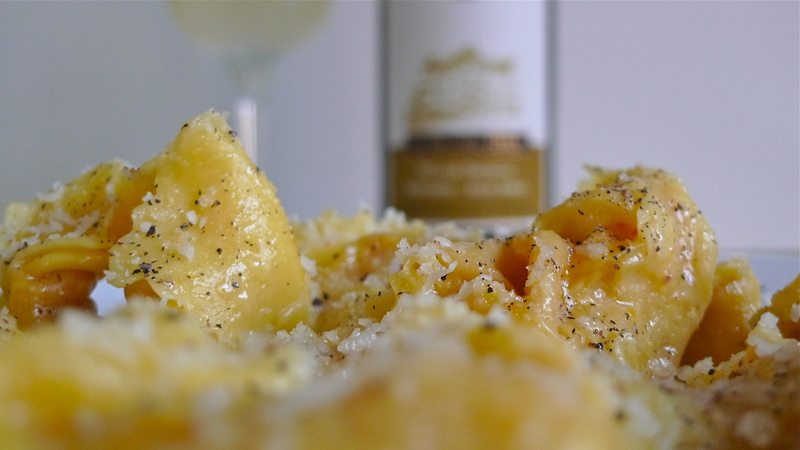 And, she was spot-on as this bottle married perfectly with the tortelloni stuffed with pumpkin and amaretti. St. Michael’s Winery, located along the prestigious Weinstraße (Wine Road) in the town of Appiano/Eppan in Italy’s northernmost region of the Trentino Alto Adige/South Tyrol, was selected “Winery of the Year for 2000” by the Italian wine publication I Vini d’Italia. And, for good reason. This winery produces and markets three distinct lines — Sanct Valentin, Cru and Classic — totaling 34 different blends and varietals. 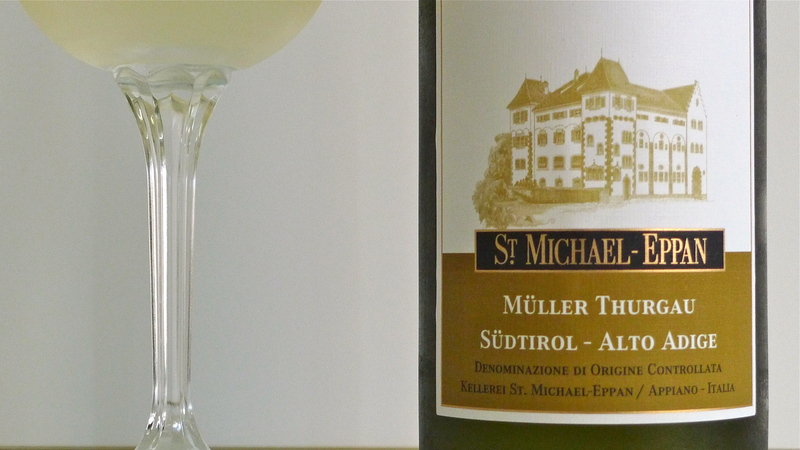 It is within the Classic line that we uncork our Alto Adige Müller Thurgau 2012 DOC. Crystal-clear with a deep, green-yellow color, this wine has a unique aromatic fullness. The bouquet is delicate hay and mild nutmeg fragrances. Charming on the palate, this varietal is uncomplicated in its simple style. Fresh tasting and easy to drink, Alto Adige Müller Thurgau 2012 DOC pairs well with a variety of dishes, especially freshwater fish. Best served chilled between 8-10 °C. Looks heavenly and the history makes for a great story. 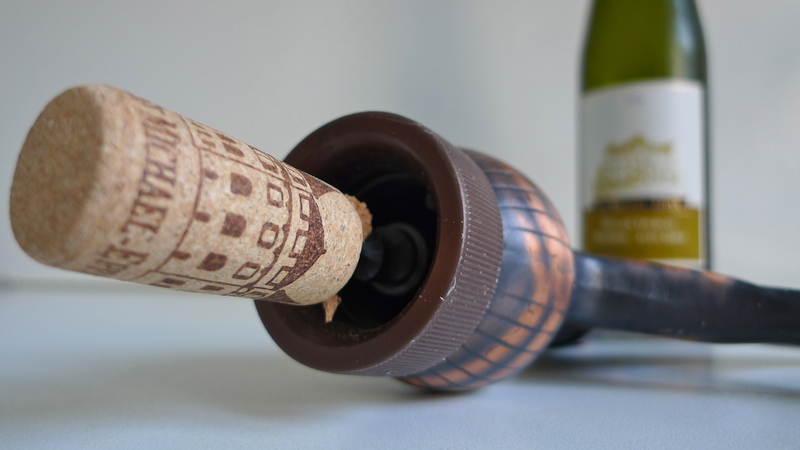 Love pasta, love Italian food, and love wine (and Italian ones are quite wonderful), so I really enjoyed this post, although thankfully I’m still full from breakfast (only mid-morning here.) 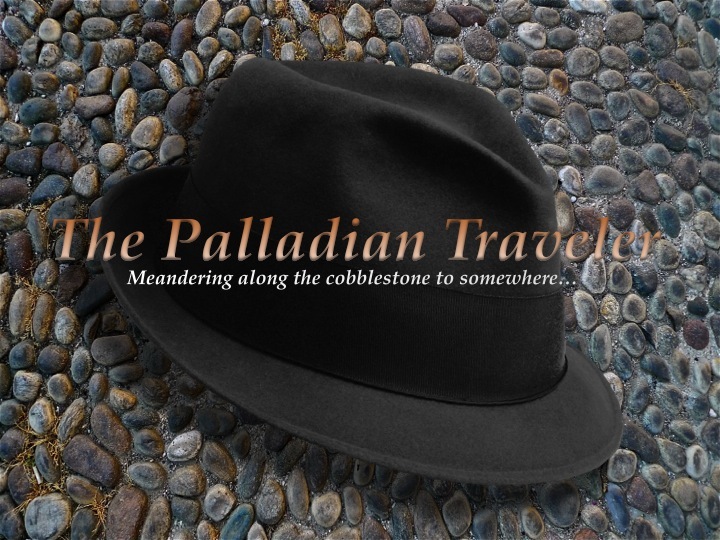 I do love the stories that go with the food and this is an especially enjoyable one. What a belly button it must have been!! Friends of ours, who upped our wine appreciation a million levels, suggested that if in doubt about which Italian wine to buy, check that back to see if it were imported by Leonardo Locascio, in which case it would be good. They were right and although we drink many wines he had nothing to do with, this formula worked more than well. Janet — Your friends are right, and your tastebuds are proof. Sig. LoCascio, Chairman of Winebow, one of the foremost importers of Italian wine to the U-S-of-A. Don’t ignore Leonardo’s name on the bottle as the importer, but do take my suggestions to heart. If I drink ’em, I love ’em. Words of wisdom that we live, and drink, by. Love Gigondas and Chateuneuf as well, although that’s switching countries. I’ll be noting your choices. I just put some biscotti in for the second baking so pop by and share. 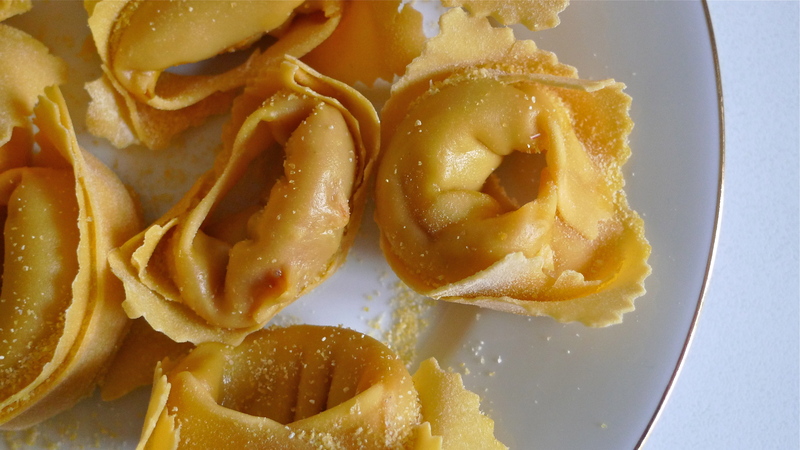 Meredith — Nice to believe the back story behind tortellini/tortelloni. The navel gets so little attention. Leave it to gli Italiani to bring it to the forefront with flair. A perfect post! I LOVE the story behind this dish, and can hardly wait to share it with my family. Amit — Don’t worry, I post lots of other non-foodie stuff, so you’ll be safe. Hey, good luck on your “camino” in Spain.